The concept of the series comes from different types of traditional Chinese container such as vase and bowl. With its elegant outline and proportion, combining with the everyday use cup shape to create a mixed item. The design tried to bring the beauty of tradition into modern daily life. When the cup filled with various drinks, the "vase" or "bowl" shows up, with different colors. People are just enjoying their time with the drinks and the art of design. * The Best Kitchen Gear Of 2014 by FastCo. 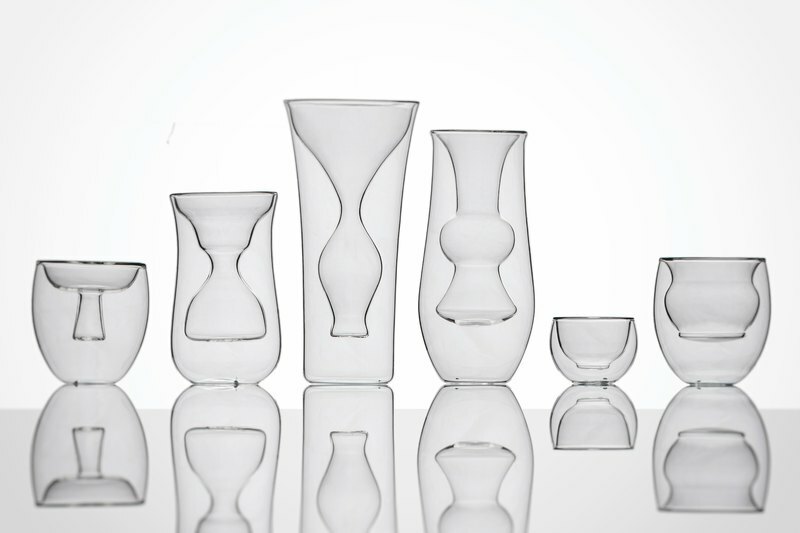 design * The Top 10 Unique Designs of 2014, BuyMeDesign, HK * “ Keep It Glassy II ”2015, Shang-Hai Museum Of Glass * “ALCHEMY：The Great Art ” , SMB-Kulturforum Berlin, Germany, 2017 [ Info ] -------- - LW01: 6.0 x 4.5 (H) 50 ml - LW02: 8.0 x 8.5(H) 50 ml - LW03: 8.0 x 8.5(H) 150 ml - LW04: 7.6 x 13.0(H) 125 ml - LW05: 9.3 x 18.8 (H) 175 ml - LW06: 8.0 x 16.8(H) 150 ml [ Notes ] ----------- - Double Wall borosilicate glass - Hand-made glass - Temp. range:-30~180 - Dishwasher safe - No heating directly on the stove or microwave. - Keep high or low temperature from your fingers - Ideal for all kinds of beverages from cocktail, coffee and ice cream...ect. - All products are hand made by artisan, each one is a unique piece and might have slightly differences.